JOHANNESBURG – Gearhouse South Africa's AV division has stocked up with an order for 100 of Christie Digital's MicroTiles. Operations manager Bhans Sheomangal credited the tiles for ease-of-use, reliability and versatility. The tiles, made with DLP technology, were purchased via Christie South Africa. When all used together as one surface, the 100 MicroTiles cover a 4 by 3 meter area. "The picture quality, reproduction and color balance are all excellent," said Sheomangal, who also pointed to the light weight of the tiles when compared to plasma or LED panels. He also noted that if the front laminated screen needs to be replaced for any reason, the operation is relatively simple. Gearhouse MicroTile projects so far have included the Vuka Awards, where for a live telecast from the Theatre on The Track at Kyalami, Midrand, the Tiles were built into a heart-shaped set piece. 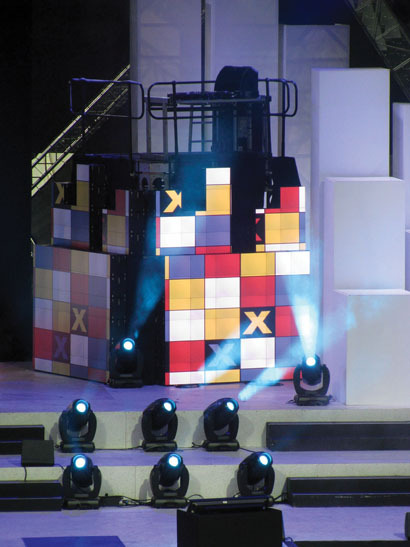 At the 2010 Metro FM Music Awards, staged in the Mbombela Stadium, Nelspruit, Gearhouse provided a section of the set made from MicroTiles behind the presenter platform. For the ANC Lekgotla strategy meeting in Mogale City Krugersdorp the tiles were deployed to provide multiple power point presentation and information points. The Gearhouse marketing department has also found the MicroTiles useful for Gearhouse's current exhibition stand, playing back video clips, montages and stills images illustrating a diverse range of projects and events. The Micro Tiles can be fed with any video input. For some of these applications, they have been run via grandMA VPUs triggered from a lighting console, and on others by a Wings Platinum screen/display management system. For more information, please visit www.gearhouse.co.za and www.christiedigital.com.